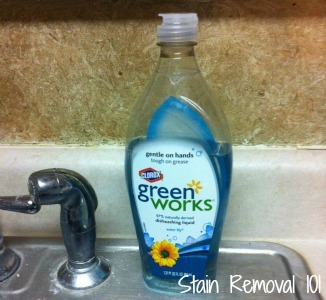 I'm currently using a bottle of Clorox Green Works natural dishwashing liquid, in the water lily scent. Overall, I love the scent of this dish soap. It smells both florally (is that a word?) and citrusy (again, is that really a word) at the same time, but it is still quite light and not at all over powering. Even my husband mentioned that he liked the smell. It also washes the dishes, pots and pans quite well, including cutting grease. I also like that it is an eco-friendly cleaning product, and it states on the bottle that it is 97% naturally derived. On the negative side, however, the soap seems a bit thin to me. It doesn't seem to effect its cleaning power but it does mean, for example, that the first time I squirted any out a LOT more came out onto the sponge than I was anticipating. Basically, the thinness makes it come out faster than you may expect and this can waste soap. Other than that I really like this particular brand, and I think if I get the chance I'd like to try the Tangerine scent another time, since I imagine I might like that as well. Plus, although I didn't get it myself, I appreciate the fact that there is a free and clear version available for those who want something both green and hypoallergenic at the same time. I would love to hear from others who have used this product sharing how it has worked for you, good or bad. You can share your natural dish liquid reviews here, for this or any other brand. In addition, you can read reviews of many other brands, scents and varieties that have already been submitted by other readers.